The Partnership and Cooperation Agreement between the European Union and its Member States, of the one part, and the Republic of Iraq, of the other part (1), entered into force on 1 August 2018, the procedure provided for in Article 116.1 of the Cooperation Agreement having been completed on 20 July 2018. (1) OJ L 204, 31.7.2012, p. 20. Commission Regulation (EU) No 1321/2014 (2) establishes the implementing rules on the continuing airworthiness of aircraft and aeronautical products, parts and appliances and on the approval of organisations and personnel involved in these tasks. In order to ensure a high uniform level of aviation safety, there is a need for a system, established at Union level, for the licencing of certifying staff involved in the maintenance of ELA1 aeroplanes and for aircraft other than aeroplanes and helicopters. That system should be simple and proportionate. Therefore, necessary measures should now be taken in order to set up such a system. The existing requirements related to a licence for certifying staff involved in the maintenance of avionics and electrical systems of aircraft other than those in the group of complex aircraft are not proportionate to the lower complexity of those aircraft, in particular because a significant amount of basic knowledge requirements are only relevant in relation to complex aircraft. A new licence for such staff should there be introduced. The requirements for that new licence should ensure that the level of safety is not reduced compared to the one achieved with the existing licence. The introduction of that new licence should reduce potential safety risks which could occur as a consequence of insufficient adequately qualified and licensed staff being available for the maintenance tasks concerned. During performance of maintenance, it is common that persons or organisations use components, parts or material provided by third parties. It is necessary to mitigate the risks associated to the acceptance of such components, parts or material and, in particular, to ensure that the persons and organisations concerned take the necessary measures to ensure proper acceptance, classification and segregation thereof. A significant number of fraud cases, showing a deliberate violation of the examination standards set in accordance with Regulation (EU) No 1321/2014, have been reported to the European Aviation Safety Agency (‘Agency’). Those cases related to basic knowledge examinations performed by approved maintenance training organisations for students who did not attend the basic training course. This situation has led to important safety concerns, in particular in light of the risk of licence holders releasing to service aircraft after maintenance without having the basic knowledge required. Measures should now be taken to address those safety concerns. Pursuant to Regulation (EU) No 1321/2014, operators of complex motor-powered aircraft, in commercial or non-commercial operations, are to ensure that the tasks associated with continuing airworthiness are performed by an approved continuing airworthiness management organisation and that the maintenance of the aircraft and components for installation thereon is performed by an approved maintenance organisation. However, in certain cases, such as in the non-commercial operation of lighter twin-turboprop aeroplanes, the compliance effort that is required from such operators is disproportionate to the benefits that implementing those requirements bring to the safety of their operations. The requirements applicable in those cases should therefore be adapted. Considering those disproportionate compliance efforts, the time needed to adapt those requirements and that not applying them in those cases until they have been adapted is not assessed to pose any significant risks to aviation safety, those requirements should cease to apply for the time being and apply only from an appropriate later date. Detailed rules regarding the use of Appendix VI of Annex III to Regulation (EU) No 1321/2014 were deleted by mistake when Regulation (EU) No 1321/2014 was amended by Regulation (EU) 2015/1536 (3). That mistake should be corrected. Certain editorial errors leading to implementation difficulties have been identified in Annex Va to Regulation (EU) No 1321/2014. Those errors should be corrected. It is necessary to provide sufficient time to all parties concerned to adapt to the amended regulatory framework created as a consequence of the measures laid down in this Regulation. Those measures should therefore become applicable six months after the date of its entry into force. However, given their purpose and the absence of a need for any significant efforts to adapt by the parties concerned, certain measures should apply without delay. Certain other measures require more adaptation efforts and should therefore apply from an appropriate later date, however, because they entail the transition from regulation primarily under national law to the amended regulatory framework under Union law laid down in this Regulation. Regulation (EU) No 1321/2014 should therefore be amended accordingly. The measures provided for in this Regulation are in accordance with opinions of the Agency submitted pursuant to Article 19(1) of Regulation (EC) No 216/2008. Annex Va (Part-T) is amended in accordance with Annex V to this Regulation. It shall apply from 5 March 2019.
the requirement for certifying staff to be qualified in accordance with Annex III (Part-66) laid down in points M.A.606(g) and M.A.801(b)(2) of Annex I (Part-M) and in point 145.A.30(g) and (h) of Annex II (Part-145) shall apply from 1 October 2020. Done at Brussels, 14 August 2018. (2) Commission Regulation (EU) No 1321/2014 of 26 November 2014 on the continuing airworthiness of aircraft and aeronautical products, parts and appliances, and on the approval of organisations and personnel involved in these tasks (OJ L 362, 17.12.2014, p. 1). (3) Commission Regulation (EU) 2015/1536 of 16 September 2015 amending Regulation (EU) No 1321/2014 as regards alignment of rules for continuing airworthiness with Regulation (EC) No 216/2008, critical maintenance tasks and aircraft continuing airworthiness monitoring (OJ L 241, 17.9.2015, p. 16). Components which are in a satisfactory condition, released on an EASA Form 1 or equivalent and marked in accordance with Subpart Q of Annex I (Part 21) to Regulation (EU) No 748/2012, unless otherwise specified in Annex I (Part 21) to Regulation (EU) No 748/2012 or in this Annex (Part-M). Unserviceable components which shall be maintained in accordance with this Regulation. Components categorised as unsalvageable because they have reached their certified life limit or contain a non-repairable defect. Standard parts used on an aircraft, engine, propeller or other aircraft component when specified in the maintenance data and accompanied by evidence of conformity traceable to the applicable standard. Material both raw and consumable used in the course of maintenance when the organisation is satisfied that the material meets the required specification and has appropriate traceability. All materials must be accompanied by documentation clearly relating to the particular material and containing a conformity to specification statement plus both the manufacturing and supplier source. Overhaul of engines and propellers while installed or temporarily removed from CS-VLA, CS-22 and LSA aircraft not used in commercial air transport. Unserviceable and unsalvageable components shall be segregated from serviceable components, standards parts and materials. ‘The following constitutes the complex maintenance tasks referred to in points M.A.801(b)2 and M.A.801(c)’. The organisation shall ensure that personnel who carry out or control a continued-airworthiness non-destructive test of aircraft structures or components, or both, are appropriately qualified for the particular non-destructive test in accordance with the European or equivalent standard recognised by the Agency. Personnel who carry out any other specialised task shall be appropriately qualified in accordance with officially recognised standards. By derogation from this point, personnel referred to in point (g), points (h)(1) and (h)(2), qualified in category B1, B3 or L in accordance with Annex III (Part-66), may carry out and/or control colour contrast dye penetrant tests. Any organisation maintaining aircraft, except where stated otherwise in point (j), shall in the case of aircraft line maintenance, have appropriate aircraft-rated certifying staff qualified as category B1, B2, B2L, B3 and L, as appropriate, in accordance with Annex III (Part-66) and point 145.A.35. In addition such organisations may also use appropriately task-trained certifying staff holding the privileges set out in points 66.A.20(a)(1) and 66.A.20(a)(3)(ii) and qualified in accordance with Annex III (Part-66) and point 145.A.35 to carry out minor scheduled line maintenance and simple defect rectification. The availability of such certifying staff shall not replace the need for category B1, B2, B2L, B3 and L certifying staff, as appropriate. in the case of base maintenance of complex motor-powered aircraft, have appropriate aircraft-type-rated certifying staff, qualified as category C in accordance with Annex III (Part-66) and point 145.A.35. In addition, the organisation shall have sufficient aircraft-type-rated staff qualified as category B1 and B2, as appropriate, in accordance with Annex III (Part-66) and point 145.A.35 to support the category C certifying staff. Category B1 and B2 support staff shall ensure that all relevant tasks or inspections have been carried out to the required standard before the category C certifying staff issues the certificate of release to service. The organisation shall maintain a register of any such category B1 and B2 support staff. The category C certifying staff shall ensure that compliance with point (i) has been met and that all work required by the customer has been accomplished during the particular base maintenance check or work package, and shall also assess the impact of any work not carried out, with a view to either requiring its accomplishment or agreeing with the operator to defer such work to another specified check or time limit. appropriate aircraft-rated certifying staff, qualified in category C and assisted by support staff, as set out in point 145.A.35(a)(i). In addition to the requirements of points 145.A.30(g) and (h), the organisation shall ensure that certifying staff and support staff have an adequate understanding of the relevant aircraft or components, or both, to be maintained and of the associated organisation procedures. In the case of certifying staff, this shall be accomplished before the issue or reissue of the certification authorisation. ‘Support staff’ means those staff holding an aircraft maintenance licence under Annex III (Part-66) in category B1, B2, B2L, B3 and/or L with the appropriate aircraft ratings, working in a base maintenance environment while not necessarily holding certification privileges. ‘Relevant aircraft and/or components’, means those aircraft or components specified in the particular certification authorisation. ‘Certification authorisation’ means the authorisation issued to certifying staff by the organisation and which specifies the fact that those staff may sign certificates of release to service within the limitations stated in such authorisation on behalf of the approved organisation. The organisation shall have available and use the necessary equipment and tools to perform the approved scope of work. Where the manufacturer specifies a particular tool or equipment, the organisation shall use that tool or equipment, unless the use of alternative tooling or equipment is agreed by the competent authority via procedures specified in the exposition. Equipment and tools must be permanently available, except in the case of any tool or equipment that is so infrequently used that its permanent availability is not necessary. Such cases shall be detailed in an exposition procedure. Components which are in a satisfactory condition, released on an EASA Form 1 or equivalent and marked in accordance with Subpart Q of the Annex I (Part 21) to Regulation (EU) No 748/2012, unless otherwise specified in Annex I (Part 21) to Regulation (EU) No 748/2012 or in this Annex II (Part 145). Material, both raw and consumable, used in the course of maintenance when the organisation is satisfied that the material meets the required specification and has appropriate traceability. All material shall be accompanied by documentation clearly relating to the particular material and containing a conformity to specification statement as well as the manufacturing and supplier source. The organisation shall establish procedures for the acceptance of components, standard parts and materials for installation to ensure that components, standard parts and materials are in satisfactory condition and meet the applicable requirements of point (a). The organisation shall establish procedures to ensure that components, standard parts and materials shall only be installed on an aircraft or a component when they are in satisfactory condition, meet the applicable requirements of point (a) and the applicable maintenance data specifies the particular component, standard part or material. The organisation may fabricate a restricted range of parts to be used in the course of undergoing work within its own facilities, provided procedures are identified in the exposition. Components referred to in point 21.A.307(c) of the Annex I (Part 21) to Regulation (EU) No 748/2012 shall only be installed if considered eligible for installation by the aircraft owner on its own aircraft. Unsalvageable components shall not be permitted to re-enter the component supply system, unless certified life limits have been extended or a repair solution has been approved in accordance with Regulation (EU) No 748/2012.’. The B2 licence is applicable to all aircraft. A B2L licence shall contain, as a minimum, one system rating. The B3 licence is applicable to piston-engine non-pressurised aeroplanes of 2 000 kg Maximum Take-off Mass (MTOM) and below. L5: gas airships other than ELA2. Group 1: complex motor-powered aircraft, helicopters with multiple engines, aeroplanes with maximum certified operating altitude exceeding FL290, aircraft equipped with fly-by-wire systems, gas airships other than ELA2 and other aircraft requiring an aircraft type rating when defined as such by the Agency. The Agency may decide to classify into Group 2, Group 3 or Group 4, as appropriate, an aircraft which meets the conditions set out in the first subparagraph, if it considers that the lower complexity of the particular aircraft justifies so. those turbojet and multiple-turboprop aeroplanes classified by the Agency in this subgroup because of their lower complexity. those multiple turbine engine helicopters classified by the Agency in this subgroup because of their lower complexity. those multiple piston engine helicopters classified by the Agency in this subgroup because of their lower complexity. Group 3: piston engine aeroplanes other than those in Group 1.
when holding the ‘airframe system’ rating, performance of electrical and avionics tasks within power plant and mechanical systems, requiring only simple tests to prove their serviceability. work on other avionics systems requiring simple tests to prove their serviceability. Subcategory L2 includes subcategory L1. Any limitation to subcategory L2 in accordance with point 66.A.45(h) becomes also applicable to subcategory L1. Subcategory L2C includes subcategory L1C. An applicant for an aircraft maintenance licence in category L within a given subcategory, or for the addition of a different subcategory, shall demonstrate by examination a level of knowledge of the appropriate subject modules in accordance with Appendix VII to Annex III (Part-66). The examination shall comply with the standard set out in Appendix VIII to Annex III (Part-66) and shall be conducted by a training organisation appropriately approved in accordance with Annex IV (Part-147), by the competent authority or as agreed by the competent authority. The holder of an aircraft maintenance licence in subcategory B1.2 or category B3 is deemed to meet the basic knowledge requirements for a licence in subcategories L1C, L1, L2C and L2. The basic knowledge requirements for subcategory L4H include the basic knowledge requirements for subcategory L3H. The basic knowledge requirements for subcategory L4G include the basic knowledge requirements for subcategory L3G. The training courses and examinations shall have been passed within 10 years prior to the application for an aircraft maintenance licence or the addition of a category or subcategory to such a licence. Should this not be the case, examination credits may be obtained in accordance with point (e). any other technical qualification considered by the competent authority to be equivalent to the knowledge standard of Annex III (Part-66). Credits shall be granted in accordance with Subpart E of Section B of this Annex (Part-66). 1 year of practical maintenance experience in operating aircraft, covering the corresponding system rating(s), and completion of a Part-147 approved basic training course. For the addition of (a) new system rating(s) to an existing B2L licence, 3 months of practical maintenance experience relevant to the new system rating(s) shall be required for each system rating added. as a derogation from point (i), 1 year of practical maintenance experience in operating aircraft covering a representative cross section of maintenance activities in the corresponding subcategory, subject to the introduction of the limitation provided for in point 66.A.45(h)(ii)(3). For the inclusion of an additional subcategory in an existing L licence, the experience required by points (i) and (ii) shall be 12 and 6 months respectively. for Group 4 aircraft, for the category B2 licence, the full group rating. for Group 4 aircraft, the full group rating. For category B3, the relevant rating is ‘piston-engine non-pressurised aeroplanes of 2 000 kg MTOM and below’. for subcategory L5, the appropriate airship type rating. For category A, no rating is required, subject to compliance with the requirements of point 145.A.35 of Annex II (Part-145). in the case of gas airship type ratings on a B2 or L5 licence, a type training approved by the competent authority in accordance with point 66.B.130. For other than category C licences, in addition to the requirements of point (b), the endorsement of the first aircraft type rating within a given category/subcategory requires satisfactory completion of the corresponding on-the-job training. This on-the-job training shall comply with Appendix III to Annex III (Part-66), except in the case of gas airships, where it shall be directly approved by the competent authority. in the case of B1 and B2 category, demonstration of practical experience in the aircraft type. In that case, the practical experience shall include a representative cross section of maintenance activities relevant to the licence category. In the case of a category C rating, for a person qualified by holding an academic degree as specified in point 66.A.30(a)(7), the first relevant aircraft type examination shall be at the category B1 or B2 level. by derogation from point (e)(iii), the holder of a B2 or B2L licence, endorsed with a full subgroup 2b, is entitled to be endorsed with a full subgroup 2c. by derogation from point (f)(i), the holder of a B2L licence, endorsed with a full subgroup 2a or 2b, is entitled to be endorsed with Groups 3 and 4.
the basic knowledge requirements and the basic examination standards laid down in Appendices I and II to this Annex (Part-66). At the completion of the procedures specified in points 66.B.100 or 66.B.105, the competent authority shall endorse the additional basic category, subcategory or, for category B2L, system rating(s) on the aircraft maintenance licence by stamp and signature or shall reissue the licence. The record system of the competent authority shall be changed accordingly. the practical experience required in Appendix IV. In the case of type training for aircraft other than airships, the competent authority may approve aircraft type training not conducted by a maintenance training organisation approved in accordance with Annex IV (Part-147), pursuant to point 1 of Appendix III to this Annex (Part-66). In such case, the competent authority shall have a procedure to ensure that the aircraft type training complies with Appendix III to this Annex (Part-66). the syllabus of the technical qualification concerned, relevant to the particular category being sought. This comparison shall state whether compliance has been demonstrated and contain the justifications for each statement. Credits for examinations, other than basic knowledge examinations carried out in maintenance training organisations approved in accordance with Annex IV (Part-147), can only be granted by the competent authority of the Member State in which the qualification has been obtained, unless a formal agreement exists with such competent authority advising otherwise. No credit can be granted unless there is a statement of compliance for each module and submodule, indicating where the equivalent standard can be found in the technical qualification. Appendices I or VII to this Annex (Part-66), as applicable. Basic knowledge for categories A, B1, B2, B2L and B3 is indicated by knowledge levels (1, 2 or 3) of each applicable subject. Category C applicants shall meet either the category B1 or the category B2 basic knowledge levels. The units and components which furnish a means of entertaining the passengers and providing communication within the aircraft (Cabin Intercommunication Data System (CIDS)) and between the aircraft cabin and ground stations (Cabin Network Service (CNS)). They include voice, data, music and video transmissions. CIDS provides an interface between cockpit/cabin crew and cabin systems. These systems support data exchange between the different related Line Replaceable Units (LRUs) and they are typically operated via Flight Attendant Panels (FAPs). Operation and effect of trim tabs, servo tabs and control surface bias. Mach number, critical Mach number. Operation and effect of cyclic, collective and anti-torque controls. Automatic landing systems: principles and categories, modes of operation, approach, glideslope, land, go-around, system monitors and failure conditions. Automatic Dependent Surveillance — Broadcast (ADS-B). ARINC (Aircraft Radio Incorporated) communication and reporting. Structure-monitoring system (damage tolerance monitoring). Flow, temperature and humidity control system. Toilet system layout, flushing and servicing. The units and components which furnish a means of storing, updating and retrieving digital information traditionally provided on paper, microfilm or microfiche. They include units that are dedicated to the information storage and retrieval function such as the electronic library mass storage and controller, but they do not include units or components installed for other uses and shared with other systems, such as flight deck printer or general-use display. Air Traffic and Information Management systems and Network Server systems. Category B2: 180 multiple-choice and 0 essay questions. Time allowed: 225 minutes. Questions and time allowed may be split into two examinations, as appropriate. Category B2 and B2L: 24 multiple-choice and 0 essay questions. Time allowed: 30 minutes. For non-pressurised piston engine aeroplanes below 2 000 kg MTOM, the minimum duration can be reduced by 50 %. Experience requirements for extending a Part-66 aircraft maintenance licence. The experience shall be practical maintenance experience in operating aircraft in the subcategory relevant to the application. The experience requirement will be reduced by 50 % if the applicant has completed an approved Part-147 course relevant to the subcategory. 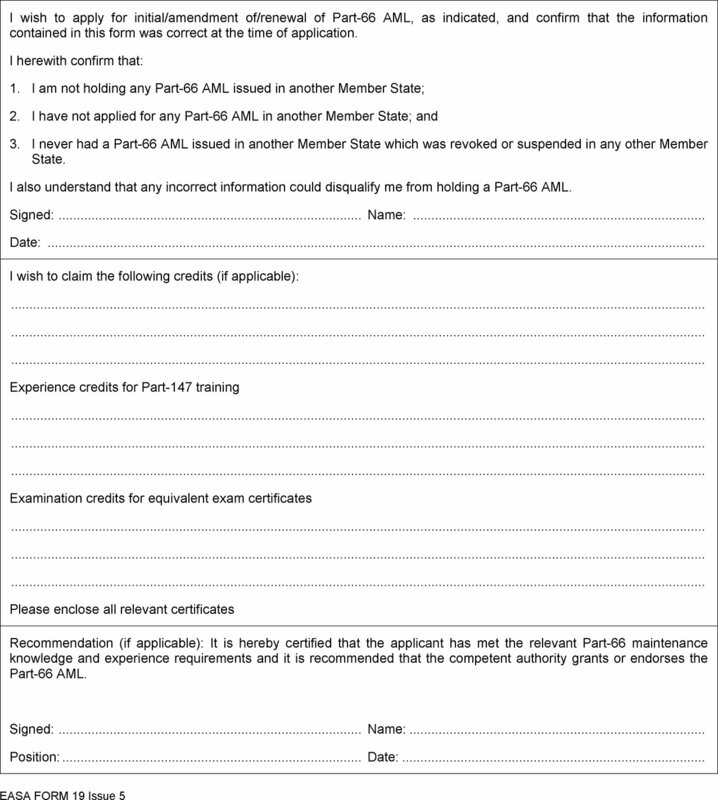 This Appendix contains an example of the form used for applying for the aircraft maintenance licence referred to in Annex III (Part-66). The competent authority of the Member State may modify the EASA Form 19 only to include additional information necessary to support the case where the national requirements permit or require the aircraft maintenance licence issued in accordance with Annex III (Part-66) to be used outside the requirements of Annex I (Part-M) and Annex II (Part-145). I wish to apply for initial/amendment of/renewal of Part-66 AML, as indicated, and confirm that the information contained in this form was correct at the time of application. 3. I never had a Part-66 AML issued in another Member State which was revoked or suspended in any other Member State. I also understand that any incorrect information could disqualify me from holding a Part-66 AML. Recommendation (if applicable): It is hereby certified that the applicant has met the relevant Part-66 maintenance knowledge and experience requirements and it is recommended that the competent authority grants or endorses the Part-66 AML. 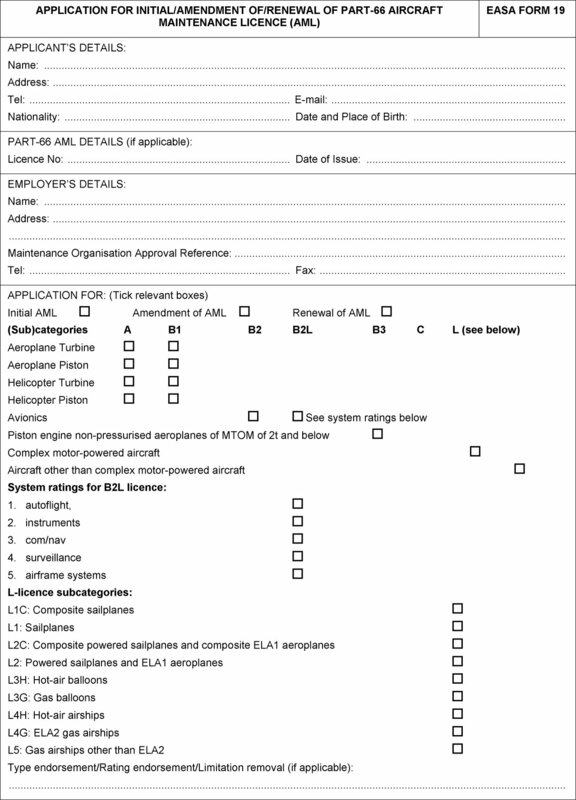 An example of the aircraft maintenance licence referred to in Annex III (Part-66) can be found on the following pages. The document shall be printed in the standardised form shown but may be reduced in size to allow it being generated by computer. When the size is reduced, care shall be taken to ensure that sufficient space is available in those places where official seals or stamps are required. 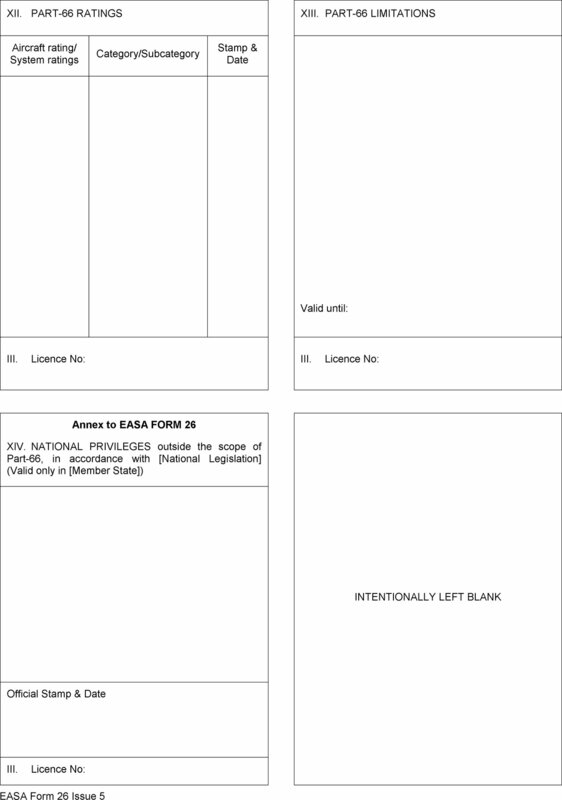 Computer-generated documents need not have all the boxes incorporated when any such box remains blank, so long as the document can clearly be recognised as an aircraft maintenance licence issued in accordance with Annex III (Part-66). The document may be filled in either in English or the official language of the Member State of the competent authority. In the latter case, a second copy in English shall be attached to the document for any licence holder who needs to use the licence outside that Member State to ensure understanding for the purpose of mutual recognition. Each licence holder shall have a unique licence holder number, established on the basis of a national identifier and an alpha-numeric designator. 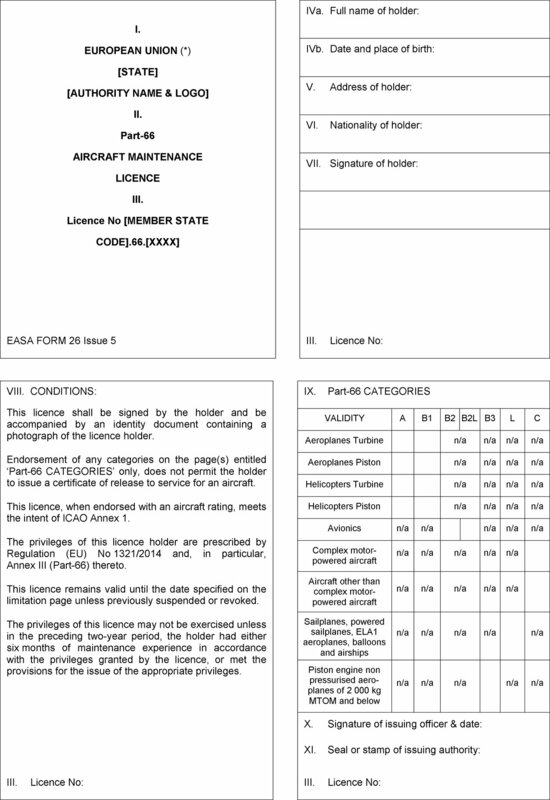 The document may have the pages in a different order to the one of this example and needs not have some or any divider lines as long as the information contained is positioned in such a manner that each page lay-out can clearly be identified with the format of the example of the aircraft maintenance licence contained herein. The document shall be prepared by the competent authority. However, it may also be prepared by any maintenance organisation approved in accordance with Annex II (Part-145), where the competent authority agrees to this and the preparation takes place in accordance with a procedure laid down in the maintenance organisation exposition referred to in point 145.A.70 of Annex II (Part-145). In all cases, the competent authority shall issue the document. The preparation of any change to an existing aircraft maintenance licence shall be carried out by the competent authority. However, it may also be prepared by any maintenance organisation approved in accordance with Annex II (Part- 145), where the competent authority agrees to this and the preparation takes place in accordance with a procedure laid down in the maintenance organisation exposition referred to in point 145.A.70 of Annex II (Part-145). In all cases, the competent authority shall change the document. The holder of the aircraft maintenance licence shall keep it in good condition and shall ensure that no unauthorised entries are made. Failure to comply with this rule may invalidate the license or lead to the holder not being permitted to hold any certification privilege. It may also result in prosecution under national law. The aircraft maintenance licence issued in accordance with Annex III (Part-66) shall be recognised in all Member States and it is not required to exchange the document when working in another Member State. The Annex to EASA Form 26 is optional and may only be used to include national privileges, where such privileges are covered by national law outside the scope of Annex III (Part-66). With regard to the aircraft type rating page of the aircraft maintenance licence, the competent authority may decide not to issue this page until the first aircraft type rating needs to be endorsed and may need to issue more than one aircraft type rating page depending on the number of type ratings to be listed. Notwithstanding point 11, each page issued shall be in the format of this example and contain the specified information for that page. The aircraft maintenance licence shall clearly indicate that the limitations are exclusions from the certification privileges. If there are no limitations applicable, the LIMITATIONS page shall state ‘No limitations’. The definitions of the different levels of knowledge required in this Appendix are the same as those contained in point 1 of Appendix I to Annex III (Part-66). Areas and volumes, squares, cubes. Graphical representation: nature and uses of graphs. Nature and properties of solids, fluids and gases. International Standard Atmosphere (ISA), application to aerodynamics and aerostatics. Generation of lift and drag: angle of attack, polar curve, stall. Effect on envelopes, wind effect, altitude and temperature effects. Remedial action in the event of a fire or another accident with one or more hazards, including knowledge of extinguishing agents. Vision, hearing, information processing, attention and perception, memory. Responsibility, motivation, peer pressure, teamwork. Fitness/health, stress, sleep, fatigue, alcohol, medication, drug abuse. Working environment (climate, noise, illumination). Applicable parts of Part-M and Part-66. Standard changes and standard repairs. Crack test (optical procedure, e.g., magnifying glass) of metal components. Corrosion and preventive methods. Health and fire safety protections. Covering materials and technologies (natural and synthetic polymers). Fatigue strength and crack testing. Performance of 100-hours/annual inspections on a wood or combination of metal-tube and fabric airframe. Procedure for FRP projects (according to Maintenance Organisation Manual) including storage conditions for material. Honeycombs (paper, FRP, metal), balsa wood, Divinycell (Contizell), development trends. Assembly of aerofoils, fuselages, control surfaces. Metal bonding, surface finishing of steel and aluminium components during bonding with FRP. Performance of 100-hour/annual inspections on an FRP airframe. Covering materials and technologies (natural and synthetic). Performance of 100-hour/annual inspections on a metal airframe. Protections: firewalls, fire protection, lightning strike bonding, turnbuckles, locking devices, dischargers. Quick-release couplings (L'Hotellier, SZD, Poland). Electric wiring, power sources, types of storage batteries, electrical parameters, electric generator, circuit breaker, energy balance, earth/ground, connectors, terminals, warnings, fuses, lamps, lightings, switches, voltmeters, ampere meters, electrical gauges. Interface between power plant and airframe. Engine and/or propeller retraction system. Possible reduction of sound emissions.